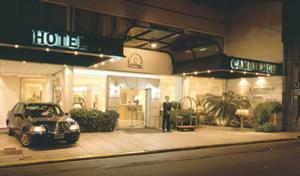 Hotel Cambremon, Buenos Aires discount hotels and accommodation. The stay at the Cambremon Hotel is an unforgettable experience, as you will count with everything you need to enjoy and live the excellence of a great hotel, from its 70 rooms we have the Superior suites and the Executives Suites . Through our highly trained and very warm staff, our service allows you to enjoy your relaxed and completely comfortable stay . Flowers and Fruits will be in the room to give you a special moment. Comfort, style and a warm hearted service plus quality you will not easily forget.These facilities make of the Cambremon Hotel one of the most modern and prestigious international hotels of the City of Buenos Aires you can make meeting´s, training courses, conferences, business meetings, sales seminars and other social events. View photos, room descriptions and make online reservations at Hotel Cambremon. Save on room prices at Hotel Cambremon, Buenos Aires.